Giovanni Francesco Leonardi and Giacoma Biagoini are the parents of Roque Leonardi who came to New Smyrna, Florida with the Andrew Turnbull expedition via Menorca. These Documents are from the Catholic Church, San Bartolomeo, in the town of Gragnanella, within the province of Garfagnana, Italy. 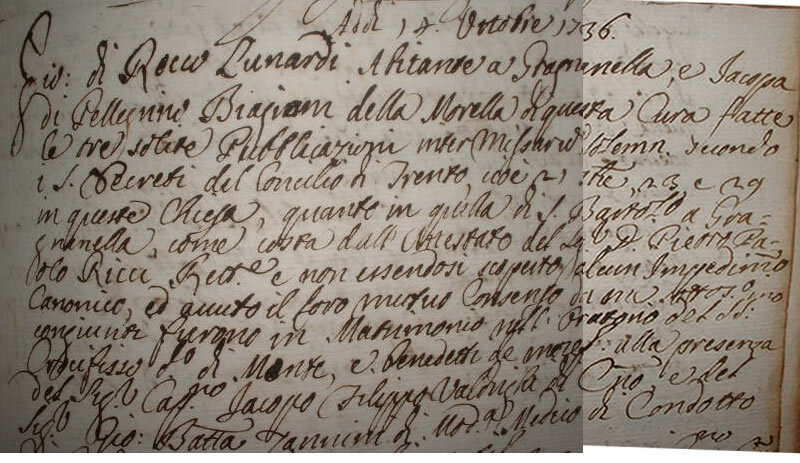 Included here is the marriage record of Giovanni Francesco Leonardi and Giacoma Biagoini and the baptismal records of their children. Included also is Roque's Confirmation Record. On these documents the spelling Lunardi is used for the surname. Follow this link for varient spellings of the surname. 1736: Giovanni, son of Rocco Lunardi, inhabitant of Gragnanella, and Giacoma, daughter of Pelligrino Biagoini. . .
Baptismal Record for Giovanni Pietro Leonardi the oldest son born 19 Nov 1737. Baptismal record for Maria Leoanrdi 8 April, 1740, the first of four Marias. This is Roque Leonardi's Baptismal Record 9 October 1741. he was named after his grandfather Rocco. Follow this link for a transcription and translation. Baptismal Record for Maria Antonia Leonardi 10 April 1744. Baptismal Record for Allessandro Leonardi 26 February 1847. Baptismal Record for Maria Magdalena Leonardi 14 March 1749/50. Baptismal Record for Maria Felicita Leonardi 20 May 1753. Confirmation Date Page Header 6 June 1747. Confirmation record of Rocco and Alessandro 6 June 1747. 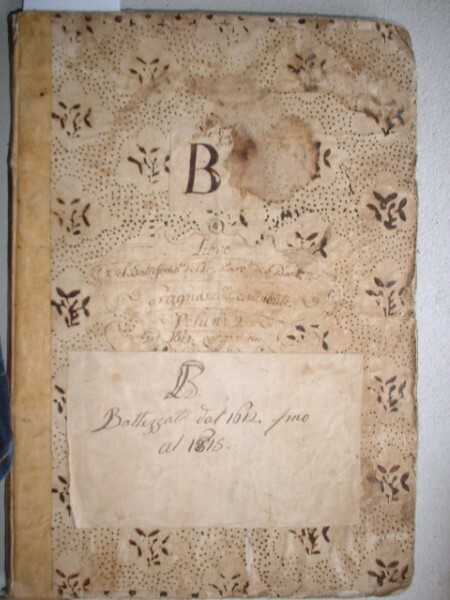 Cover of Baptismal Book 1612-1815. Cover of Confirmation Record Book 1620-1810. Cover of Record Book for deaths.